Coal ( IPA: /ˈkəʊl/) is a fossil fuel extracted from the ground by underground mining or open-pit mining ( surface mining). It is a readily combustible black or brownish-black sedimentary rock. It is composed primarily of carbon along with assorted other elements, including sulfur. Often associated with the Industrial Revolution, coal remains an enormously important fuel. It is the largest single source of fuel for the generation of electricity world-wide, and a vital component in the reduction of iron ore.
Outcrop coal was used in Britain during the Bronze Age (2-3000 years BCE), where it has been detected as forming part of the composition of funeral pyres. It was also commonly used in the early period of the Roman occupation. Evidence of trade in coal (dated to about 200 CE) has been found at the inland port of Heronbridge, near Chester, and in the Fenlands of East Anglia, where coal from the Midlands was transported via the Car Dyke for use in drying grain. Coal cinders have been found in the hearths of villas and military forts, particularly in Northumberland, dated to around 400 CE. In the west of England contemporary writers described the wonder of a permanent brazier of coal on the altar of Minerva at Aquae Sulis (modern day Bath) although in fact easily-accessible surface coal from what is now the Somerset coalfield was in common use in quite lowly dwellings locally. However, there is no evidence that the product was of great importance in Britain before the High Middle Ages, after about 1000 CE. Mineral coal came to be referred to as "seacoal," probably because it came to many places in eastern England, including London, by sea. This is accepted as the more likely explanation for the name than that it was found on beaches, having fallen from the exposed coal seams above or washed out of underwater coal seam outcrops. These easily accessible sources had largely become exhausted (or could not meet the growing demand) by the 13th century, when underground mining from shafts or adits was developed. In London there is still a Seacoal Lane (off the north side of Ludgate Hill) where the coal merchants used to conduct their business. An alternative name was "pitcoal," because it came from mines. The term originates from the Anglo-Saxon word col " charcoal" and is related to a common Germanic root of otherwise unclear origins. It is associated with the astrological sign Capricorn and is carried by thieves to protect them from detection and to help them to escape when pursued. It is an element of a popular ritual associated with New Year's Eve. To dream of burning coals is a symbol of disappointment, trouble, affliction, and loss, unless they are burning brightly, when the symbol gives promise of uplifting and advancement. In Anglo-Saxon countries, Santa Claus is said to leave a lump of coal instead of Christmas presents in the stockings of naughty children. In Scotland coal is brought to a household as a symbolic gift in the Hogmanay ritual of first-footing. Carbon forms more than 50 percent by weight and more than 70 percent by volume of coal (this includes inherent moisture). This is dependent on coal rank, with higher rank coals containing less hydrogen, oxygen and nitrogen, until 95% purity of carbon is achieved at Anthracite rank and above. Graphite formed from coal is the end-product of the thermal and diagenetic conversion of plant matter (50% by volume of water) into pure carbon. Coal usually contains a considerable amount of incidental moisture, which is the water trapped within the coal in between the coal particles. Coals are usually mined wet and may be stored wet to prevent spontaneous combustion, so the carbon content of coal is quoted as both a 'as mined' and on a 'moisture free' basis. Lignite and other low-rank coals still contain a considerable amount of water and other volatile components trapped within the particles of the coal, known as its macerals. This is present either within the coal particles, or as hydrogen and oxygen atoms within the molecules. This is because coal is converted from carbohydrate material such as cellulose, into carbon, which is an incremental process (see below). Therefore coal carbon contents also depend heavily on the degree to which this cellulose component is preserved in the coal. Other constituents of coals include mineral matter, usually as silicate minerals such as clays, illite, kaolinite and so forth, as well as carbonate minerals like siderite, calcite and aragonite. Iron sulfide minerals such as pyrite are common constituents of coals. Sulfate minerals are also found, as is some form of salt, trace amounts of metals, notably iron, uranium, cadmium, and (rarely) gold. Methane gas is another component of coal, produced from methanogenesis. Methane in coal is dangerous, as it can cause coal seam explosions, especially in underground mines, and may cause the coal to spontaneously combust. It is, however, a valuable by-product of some coal mining, serving as a significant source of natural gas. Dicrhodium fern fossils in drill core, Surat Basin, Queensland from silt parting in coal beds. Fossilised plant material implies this coal formed around plants. Coal is formed from plant remains that have been compacted, hardened, chemically altered, and metamorphosed by heat and pressure over geologic time. Coal was formed in swamp ecosystems which persisted in lowland sedimentary basins similar, for instance, to the peat swamps of Borneo today. These swamp environments were formed during slow subsidence of passive continental margins, and most seem to have formed adjacent to estuarine and marine sediments suggesting that they may have been in tidal delta environments. They are often called the " coal forests". When plants die in these peat swamp environments, their biomass is deposited in anaerobic aquatic environments where low oxygen levels prevent their complete decay by bacteria and oxidation. For masses of undecayed organic matter to be preserved and to form economically valuable coal the environment must remain steady for prolonged periods of time, and the waters feeding these peat swamps must remain essentially free of sediment. This requires minimal erosion in the uplands of the rivers which feed the coal swamps, and efficient trapping of the sediments. Eventually, and usually due to the initial onset of orogeny or other tectonic events, the coal forming environment ceases. In the majority of cases this is abrupt, with the majority of coal seams having a knife-sharp upper contact with the overlying sediments. This suggests that the onset of further sedimentation quickly destroys the peat swamp ecosystem and replaces it with meandering stream and river environments during ongoing subsidence. Generally, to form a coal seam 1 metre thick, between 10 and 30 metres of peat is required. Peat has a moisture content of up to 90%, so loss of water is of prime importance in the conversion of peat into lignite, the lowest rank of coal. Lignite is then converted by dehydrogenation and methanogenesis to sub-bituminous coal. Further dehydrogenation reactions, removing progressively more methane and higher hydrocarbon gases such as ethane, propane, etcetera, create bituminous coal and, when this process is complete at sub-metamorphic conditions, anthracite and graphite are formed. Dichrodium fern fossils from coal beds, Queensland. Coal essentially always includes fossil imprints such as these, revealing its organic origin. Evidence of the types of plants that contributed to carbonaceous deposits can occasionally be found in the shale and sandstone sediments that overlie coal deposits and within the coal. Fossil evidence is best preserved in lignites and sub-bituminous coals, though fossils in anthracite are not too rare. To date only three fossils have been found in graphite seams created from coal. The greatest coal-forming time in geologic history was during the Carboniferous era (280 to 345 million years ago). 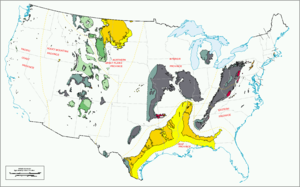 Further large deposits of coal are found in the Permian, with lesser but still significant Triassic and Jurassic deposits, and minor Cretaceous and younger deposits of lignite. In the modern European lowlands of Holland and Germany considerable thicknesses of peat have accumulated, testifying to the ubiquity of the coal-forming process. In Europe, Asia, and North America, the Carboniferous coal was formed from tropical swamp forests, which are sometimes called the "coal forests". 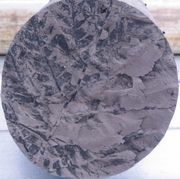 Southern hemisphere Carboniferous coal was formed from the Glossopteris flora, which grew on cold periglacial tundra when the South Pole was a long way inland in Gondwanaland. Lignite - also referred to as brown coal, is the lowest rank of coal and used almost exclusively as fuel for steam-electric power generation. Jet is a compact form of lignite that is sometimes polished and has been used as an ornamental stone since the Iron Age. Sub-bituminous coal - whose properties range from those of lignite to those of bituminous coal and are used primarily as fuel for steam-electric power generation. 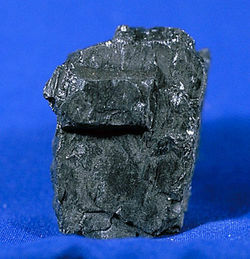 Bituminous coal - a dense coal, usually black, sometimes dark brown, often with well-defined bands of bright and dull material, used primarily as fuel in steam-electric power generation, with substantial quantities also used for heat and power applications in manufacturing and to make coke. Anthracite - the highest rank; a harder, glossy, black coal used primarily for residential and commercial space heating. Coal is primarily used as a solid fuel to produce electricity and heat through combustion. World coal consumption is about 5,800 million short tons (5.3 petagrams) annually, of which about 75% is used for the production of electricity . The region including the People's Republic of China and India uses about 1,700 long tons (1.5 Pg) annually, forecast to exceed 3,000 million short tons (2.7 Pg) in 2025. The USA consumes about 1,100 million short tons (1.0 Pg) of coal each year, using 90% of it for generation of electricity. Coal is the fastest growing energy source in the world, with coal use increasing by 25% for the three-year period ending in December 2004 (BP Statistical Energy Review, June 2005). When coal is used for electricity generation, it is usually pulverized and then burned in a furnace with a boiler. The furnace heat converts boiler water to steam, which is then used to spin turbines which turn generators and create electricity. The thermodynamic efficiency of this process has been improved over time. "Standard" steam turbines have topped out with about 35–40% thermodynamic efficiency for the entire process, but the emergence of supercritical turbines running at extremely high temperatures and pressures has led to efficiencies of 46%, with further increases in temperature and pressure offering potential for even higher efficiencies Approximately 40% of the world electricity production uses coal, and the total known deposits recoverable by current technologies are sufficient for 300 years' use at current usage levels, although maximal production could be reached within decades (see World Coal Reserves, below). A promising, more energy-efficient way of using coal for electricity production would be via solid-oxide fuel cells or molten-carbonate fuel cells (or any oxygen ion transport based fuel cells that do not discriminate between fuels, as long as they consume oxygen), which would be able to get 60%–85% combined efficiency (direct electricity + waste heat steam turbine). Currently these fuel cell technologies can only process gaseous fuels, and they are also sensitive to sulfur poisoning, issues which would first have to be worked out before large scale commercial success is possible with coal. As far as gaseous fuels go, one idea is pulverized coal in a gas carrier, such as nitrogen. Another option is coal gasification with water, which may lower fuel cell voltage by introducing oxygen to the fuel side of the electrolyte, but may also greatly simplify carbon sequestration. Coke is a solid carbonaceous residue derived from low-ash, low-sulfur bituminous coal from which the volatile constituents are driven off by baking in an oven without oxygen at temperatures as high as 1,000 °C (1,832 °F) so that the fixed carbon and residual ash are fused together. Coke is used as a fuel and as a reducing agent in smelting iron ore in a blast furnace. Coke from coal is grey, hard, and porous and has a heating value of 24.8 million Btu/ton (29.6 MJ/kg). Byproducts of this conversion of coal to coke include coal tar, ammonia, light oils, and " coal-gas". Petroleum coke is the solid residue obtained in oil refining, which resembles coke but contains too many impurities to be useful in metallurgical applications. High prices of oil and natural gas are leading to increased interest in "BTU Conversion" technologies such as coal gasification, methanation and liquification. Coal gasification breaks down the coal into its components, usually by subjecting it to high temperature and pressure, using steam and measured amounts of oxygen. This leads to the production of carbon dioxide and oxygen, as well as other gaseous compounds. In the past, coal was converted to make coal gas, which was piped to customers to burn for illumination, heating, and cooking. At present, the safer natural gas is used instead. South Africa still uses gasification of coal for much of its petrochemical needs. Gasification is also a possibility for future energy use, as it generally burns hotter and cleaner than conventional coal and can thus spin a more efficient gas turbine rather than a steam turbine. It also makes for the possibility of zero carbon dioxide emissions even though the energy comes from the conversion of carbon to carbon dioxide. This is because gasification produces a much higher concentration of carbon dioxide than direct combustion of coal in air (which is mostly nitrogen). The higher concentrations of carbon dioxide makes carbon capture and storage more economical than it otherwise would be. Coal can also be converted into liquid fuels like gasoline or diesel by several different processes. The Fischer-Tropsch process of indirect synthesis of liquid hydrocarbons was used in Nazi Germany for many years and is today used by Sasol in South Africa — in both cases because those regimes were politically isolated and unable to purchase crude oil on the open market. Coal would be gasified to make syngas (a balanced purified mixture of CO and H2 gas) and the syngas condensed using Fischer-Tropsch catalysts to make light hydrocarbons which are further processed into gasoline and diesel. Syngas can also be converted to methanol, which can be used as a fuel, fuel additive, or further processed into gasoline via the Mobil M-gas process. A direct liquefaction process Bergius process (liquefaction by hydrogenation) is also available but has not been used outside Germany, where such processes were operated both during World War I and World War II. SASOL in South Africa has experimented with direct hydrogenation. Several other direct liquefaction processes have been developed, among these being the SRC-I and SRC-II (Solvent Refined Coal) processes developed by Gulf Oil and implemented as pilot plants in the United States in the 1960's and 1970's. Another direct hydrogenation process was explored by the NUS Corporation in 1976 and patented by Wilburn C. Schroeder. The process involved dried, pulverized coal mixed with roughly 1wt% molybdenum catalysis. Hydrogenation occurred by use of high temperature and pressure synthesis gas produced in a separate gasifier. The process ultimately yielded a synthetic crude product, Naptha, a limited amount of C3/C4 gas, light-medium weight liquids (C5-C10) suitable for use as fuels, small amounts of NH3 and significant amounts of CO2. Yet another process to manufacture liquid hydrocarbons from coal is low temperature carbonization (LTC). Coal is coked at temperatures between 450 and 700 °C compared to 800 to 1000 °C for metallurgical coke. These temperatures optimize the production of coal tars richer in lighter hydrocarbons than normal coal tar. The coal tar is then further processed into fuels. The Karrick process was developed by Lewis C. Karrick, an oil shale technologist at the U.S. Bureau of Mines in the 1920s. All of these liquid fuel production methods release carbon dioxide (CO2) in the conversion process, far more than is released in the extraction and refinement of liquid fuel production from petroleum. If these methods were adopted to replace declining petroleum supplies carbon dioxide emissions would be greatly increased on a global scale. For future liquefaction projects, Carbon dioxide sequestration is proposed to avoid releasing it into the atmosphere. As CO2 is one of the process streams, sequestration is easier than from flue gases produced in combustion of coal with air, where CO2 is diluted by nitrogen and other gases. Sequestration will, however, add to the cost. 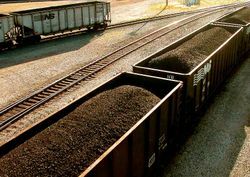 Coal liquefaction is one of the backstop technologies that could potentially limit escalation of oil prices and mitigate the effects of transportation energy shortage under peak oil. This is contingent on liquefaction production capacity becoming large enough to satiate the very large and growing demand for petroleum. Estimates of the cost of producing liquid fuels from coal suggest that domestic U.S. production of fuel from coal becomes cost-competitive with oil priced at around 35 USD per barrel , (break-even cost). This price, while above historical averages, is well below current oil prices. This makes coal a viable financial alternative to oil for the time being, although production is not great enough to make synfuels viable on a large scale. . Among commercially mature technologies, advantage for indirect coal liquefaction over direct coal liquefaction are reported by Williams and Larson (2003). Estimates are reported for sites in China where break-even cost for coal liquefaction may be in the range between 25 to 35 USD/barrel of oil. Combustion of coal, like any other compound containing carbon, produces carbon dioxide (CO2) and nitrogen oxides (NOx) along with varying amounts of sulfur dioxide (SO2) depending on where it was mined. Sulfur dioxide reacts with oxygen to form sulfur trioxide (SO3), which then reacts with water to form sulfuric acid. The sulfuric acid is returned to the Earth as acid rain. Emissions from coal-fired power plants represent the largest source of carbon dioxide emissions, which have been implicated as the primary cause of global warming. Coal mining and abandoned mines also emit methane, another cause of global warming. Since the carbon content of coal is much higher than oil, burning coal is a more serious threat to the stability of the global climate. Many other pollutants are present in coal power station emissions. A study commissioned by environmental groups claims that coal power plant emissions are responsible for tens of thousands of premature deaths annually in the United States alone. Modern power plants utilize a variety of techniques to limit the harmfulness of their waste products and improve the efficiency of burning, though these techniques are not subject to standard testing or regulation in the U.S. and are not widely implemented in some countries, as they add to the capital cost of the power plant. To eliminate CO2 emissions from coal plants, carbon capture and storage has been proposed but has yet to be commercially used. Coal and coal waste products including fly ash, bottom ash, boiler slag, and flue gas desulferization contain many heavy metals, including arsenic, lead, mercury, nickel, vanadium, beryllium, cadmium, barium, chromium, copper, molybdenum, zinc, selenium and radium, which are dangerous if released into the environment. Coal also contains low levels of uranium, thorium, and other naturally-occurring radioactive isotopes whose release into the environment may lead to radioactive contamination. While these substances are trace impurities, enough coal is burned that significant amounts of these substances are released, paradoxically resulting in more radioactive waste than nuclear power plants. Due to its scientifically accepted connection with climate change , the world's reliance on coal as an energy source, and health concerns in areas with poor air pollution controls, The Economist recently labeled the burning of coal "Environmental Enemy No. 1." The energy density of coal is roughly 24 Megajoules per kilogram. It is perhaps more useful to put this into another unit of energy, kilowatt-hours. This is the unit that electricity is most commonly sold in. In that case, the energy density of coal is 6.67 kW*hours/kg. A typical Thermodynamic efficiency of coal power plants is about 30%. Of the 6.67 kW*hours of energy per kilogram of coal, about 30% of that can successfully be turned into electricity - the rest is waste heat. Coal power plants obtain ~2.3 kW*hours/kg of burned coal. It takes 838 pounds of coal to power a computer for one full year. There are hundreds of coal fires burning around the world. Those burning underground can be difficult to locate and many cannot be extinguished. Fires can cause the ground above to subside, combustion gases are dangerous to life, and breaking out to the surface can initiate surface wildfires. See also Mine fire. Coal seams can be set on fire by spontaneous combustion or contact with a mine fire or surface fire. A grass fire in a coal area can set dozens of coal seams on fire. Coal fires in China burn 120 million tons of coal a year, emitting 360 million metric tons of carbon dioxide. This amounts to 2-3% of the annual worldwide production of CO2 from fossil fuels, or as much as emitted from all of the cars and light trucks in the United States. In Centralia, Pennsylvania (a borough located in the Coal Region of the United States) an exposed vein of coal ignited in 1962 due to a trash fire in the borough landfill, located in an abandoned anthracite strip mine pit. Attempts to extinguish the fire were unsuccessful, and it continues to burn underground to this day. The reddish siltstone rock that caps many ridges and buttes in the Powder River Basin ( Wyoming), and in western North Dakota is called porcelanite, which also may resemble the coal burning waste " clinker" or volcanic " scoria." Clinker is rock that has been fused by the natural burning of coal. In the case of the Powder River Basin approximately 27 to 54 billion metric tons of coal burned within the past three million years. Wild coal fires in the area were reported by the Lewis and Clark Expedition as well as explorers and settlers in the area. The Australian Burning Mountain was originally believed to be a volcano, but the smoke and ash comes from a coal fire which may have been burning for over 5,500 years. It has been estimated that, as of 1996, there is around one exagram (1 × 1015 kg or 1 trillion tonnes) of total coal reserves accessible using current mining technology, approximately half of it being hard coal. The energy value of all the world's coal is well over 100,000 quadrillion Btu (100 zettajoules). There is probably enough coal to last for 300 years. However, this estimate assumes no rise in population, and no increased use of coal to attempt to compensate for the depletion of natural gas and petroleum. A recent (2003) study by scientist Gregson Vaux, which takes those factors into account, estimates that coal could peak in the United States as early as 2032, on average. "Peak" does not mean coal will disappear, but defines the time after which no matter what efforts are expended, coal production will begin to decline in quantity and energy content. The disappearance of coal will occur much later, around the year 2267, assuming all other factors do not change. British Petroleum, in its annual report 2006, estimated at 2005 end, there were 909,064 million tons of proved coal reserves worldwide, or 155 years reserve to production ratio. The United States Department of Energy uses estimates of coal reserves in the region of 1,081,279 million short tons, which is about 4,786 BBOE (billion barrels of oil equivalent) . The amount of coal burned during 2001 was calculated as 2.337 GTOE (gigatonnes of oil equivalent), which is about 46 MBOED (million barrels of oil equivalent per day) . At that rate those reserves will last 285 years. As a comparison natural gas provided 51 MBOED, and oil 76 MBD (million barrels per day) during 2001. Of the 3 fossil fuels coal has the most widely distributed reserves, and coal is mined in over 100 countries, and on all continents except Antarctica. The largest reserves are found in the USA, Russia, China, Pakistan, India, Australia and South Africa.